Fig. 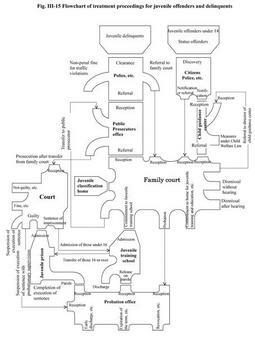 III-15 shows the flow of treatment of juvenile delinquents. Based on the aforementioned points of amendment under the Amended Juvenile Law, treatment of juvenile delinquents is outlined (hereinafter, the parts amended or newly created under this Amended Juvenile Law, are shown in bold face). When the police and other authorities clear a juvenile delinquent (excluding cases related to the payment of non-penal fines under the traffic violation notification system), the case is referred directly to a family court (for offenses liable to fines or lesser punishment), or to a public prosecutor (for other offenses) (see Part 3, Chapter 1 for the definition of juvenile delinquents, juvenile offenders under 14 and status offenders). Following the referral, the public prosecutor completes the investigation, and refers the case to a family court with an opinion on treatment if suspicion of any offense is found, or if sufficient grounds are found to submit the case to a hearing by a family court for status offense, etc. , even when there is no suspicion of offence. The public prosecutor may not request detention, except in unavoidable circumstances. When such detention is required, the judge may detain the juvenile in a juvenile classification home. Instead of a request for detention, the public prosecutor may request protective detention for the juvenile from the judge. In this case, the juvenile is confined to a juvenile classification home according to the warrant issued by the judge. As for juvenile offenders under 14 and status offenders aged under 14, priority is given to measures under the Child Welfare Law. In principle, anyone who has discovered a child without a guardian or a child who is deemed inappropriate to be placed under the custody of a guardian should notify the case to a prefectural welfare office or child guidance center. A family court may subject the juvenile to a hearing only when the case is referred by the prefectural governor or the director of a child guidance center. Anyone who has discovered a status offender aged 14 or over should, in principle, notify the case to a family court. A police officer or a guardian may directly notify the case to a child guidance center if the status offender is less than 18 years old, and the police officer or guardian recognizes that measure under the Child Welfare Law should be applied to the juvenile first, rather than direct referral or notification to a family court. The family court that has received the case may order a family court probation officer to interview the juvenile, guardians and witnesses, and conduct other necessary investigations concerning the behavior, background, predisposition, environment, etc. of the juvenile, guardians and other persons concerned. When necessary for conducting a hearing, the family court, by a decision of protective detention, may require classification on predisposition by committing the juvenile in question to a juvenile classification home for a certain period of time. The commitment of a juvenile to a juvenile classification home may not exceed two weeks, in principle. The term of commitment may be renewed only once when special circumstances require continued detention. However, in the cases of crimes which are punishable by death penalty or imprisonment with or without labor, for which examination of witness, examination by expert, or verification regarding recognition of delinquent facts is determined or has been performed, if there are appropriate reasons to recognize that remarkable hindrances would occur to a hearing unless juveniles are admitted, the term of commitment may be further renewed no more than twice. Therefore, in such case, the term of commitment to juvenile classification home is limited to 8 weeks at maximum. The juvenile classification home conducts classification on the predisposition of the juvenile committed, based on medical science, psychology, education, sociology and other scientific expertise. Moreover, when the victims, etc. of the crimes relating to juveniles request statements of emotions regarding damage and other opinions on the crimes, the family court hears such statements itself, or orders family court probation officers to hear such statements. The family court terminates the case by making a decision for dismissal without a hearing if, in light of the result of investigations, it determines that it is impossible or inappropriate to subject the juvenile to a hearing. If the court determines that a hearing should be conducted on the juvenile, it makes a decision for commencement of such hearing. If the hearing leads the court to determine that it is impossible or unnecessary to place the juvenile under protective measures, it has to make a decision for dismissal after the hearing. The hearing by the family court is performed by one person. However, in cases where a decision to perform a hearing by a collegiate body was made by a collegiate body, the collegiate body of judges would deal therewith. The hearing in the family court is closed to the public, and is performed in a cordial manner and in a relaxed atmosphere, and must encourage delinquent juveniles to reflect on their own delinquency. The juvenile, guardians and attendants are summoned on the date of hearing. The family court probation officer is also required to be present, in principle. In addition, relatives of the juvenile, teachers and other persons deemed appropriate may be allowed to attend the hearing. Probation officers and volunteer probation officers, as well as instructors and classification specialists working for the juvenile classification home, may express their opinions with the permission of the judge. Furthermore, when the family court recognizes that, concerning crimes that caused victims to die due to intentional criminal acts, or crimes which are punishable by death penalty, life imprisonment, or imprisonment with labor or imprisonment without labor for a short-term punishment of more than 2 years, it is deemed necessary for public prosecutors to be involved with the proceedings of the hearing in order to verify the facts of the delinquency, and public prosecutors may be present at the hearing, upon a decision to that end. In addition, in such cases, if juveniles did not have a lawyer as an attendant, they must have a public attendant. With the permission of the family court, the juvenile and guardians may appoint any person as an attendant. Such permission is not required, however, to appoint an attorney in private practice as an attendant. Guardians may themselves serve as attendants with the permission of the court. If the family court determines, after the hearing, that it is appropriate to place the juvenile under protective measures, it makes an adjudication of probation, commitment to a home for juvenile training and education or a home for dependent children, or commitment to a juvenile training school. Furthermore, if it is deemed necessary, the family court prompts guardians to be liable for supervision of the juvenile, takes necessary measures such as admonition, guidance or others at the investigation or hearing, in order to prevent delinquency, or orders the family court probation officer to take such measures. The family court may also place the juvenile under tentative supervision (that is, a family court probation officer directly supervises the juvenile)for a certain period of time, if it deems such supervision necessary to determine on the protective measures. When the family court makes a decision to finalize cases relating to juveniles, if victims, etc. of such cases, etc. make an offer within 3 years after such determination, it notifies such persons of the name and address of juvenile offenders and content of final determination, etc. However, in the case that it is recognized that making such a notification would hinder the sound development of such juveniles, which is unreasonable, the same shall not apply thereto. In addition, during a hearing or 3 years after the determination of the hearing, when victims, etc. make a request to inspect or copy the records of such cases, if it is deemed necessary to execute rights for damages, or there is good cause, the family court enables such persons to inspect or copy the records of such cases. Against the adjudication on protective measures, the juvenile, or his or her legal representative or attendants, may make an appeal only on the grounds of violation of any law or regulation that affects the adjudication, grave error in facts influential to adjudication, or serious unfairness of the disposition (An attendant may not make an appeal against the clearly expressed intention of the guardians who appointed the attendant). Public prosecutors may raise appeal cases to be accepted by the High Court, only on the grounds of reasons where there are violations of laws and regulations that exert influence on decisions or misunderstanding of important facts, concerning the verification of delinquent facts, for the decision to give or not to give protective measures, for cases involving prosecutors'decisions. If the family court determines, in light of the result of the investigations or hearing, that measures under the Child Welfare Law are appropriate, it refers the case to the prefectural governor or the director of a child guidance center. When the case involves an offense punishable by death penalty or an offense punishable by imprisonment with or without labor, the family court refers the case to a public prosecutor if it determines that criminal disposition is appropriate. Also, as for cases in which victims died due to intentional criminal acts, and which the juveniles were 16 or over at the time of committing the crimes, the family courts must transfer such cases to the public prosecutor notwithstanding the stipulations above, except for cases in which measures other than criminal dispositions are considered as appropriate, in light of the motives and patterns of the crimes, the situations after the crimes, the personality, age, behavior and environment of juveniles, and other conditions. This is known as transfer. After receiving the transfer, the public prosecutor, in principle, institutes public prosecution. Subsequently, the prosecuted juvenile is subjected to the same procedure for treatment as an adult. However, some special provisions are applicable to juvenile offenders. For instance, a life sentence is imposed on offenders under the age ofl 18 at the time of offense when the death penalty is appropriate, and imprisonment of 10-15 years with or without labor is imposed instead of a life sentence. When imprisonment with or without labor for not less than three years would otherwise be imposed, this is reduced to an indeterminate sentence (defining the minimum and maximum term of imprisonment)within the scope of the applicable penalty. Also, Juveniles who were sentenced to imprisonment with or without labor serve the sentence separately from other juvenile inmates. In addition, concerning execution of punishment, juveniles under 16 who were sentenced to imprisonment with or without labor can execute such punishment at juvenile training schools until they reach 16. In such cases, labor is not imposed in the meantime even on juveniles who are sentenced to imprisonment with labor and correctional education is supposed to be given at juvenile training schools. Among juveniles who were sentenced to imprisonment with or without labor those who were sentenced to life imprisonment are eligible for parole after 7 years and those who were under 18 and were sentenced to imprisonment for a definite time instead of life imprisonment are eligible for parole after 3 years, both of which are special provisions. However, since they were 18 or below at the time of the offense, and were sentenced to life imprisonment, while they were supposed to be sentenced for a capital punishment, no stipulations regarding 7 years for those with life sentences will be applied. In principle, juveniles subjected to probation by family court adjudication are supervised by probation officers and volunteer probation officers in order to receive necessary guidance and support for their improvement and rehabilitation, until they reach 20 years of age. Measures such as the early discharge of probation are taken for juveniles who are no longer considered to pose any threat of repeat crime due to stabilization of their behavior during this period. A juvenile committed to a home for juvenile training and education or to a home for dependent children is received by the facility concerned. Homes for juvenile training and education are intended to provide necessary guidance for children who have committed or are likely to commit misdemeanors, as well as assisting them in becoming independent. Homes for dependent children are designed to provide protective care for children without guardians, abused children, etc. , and to support their reliance. A juvenile committed to a juvenile training school is admitted to a specific type of training school-primary, middle, advanced or medical-for progress toward rehabilitation with correctional education. The juvenile is placed under probationary supervision after being released on parole from the school. Other juveniles to be placed under probationary supervision include those who have been granted suspension of execution of sentence, as well as those who have been released on parole from prison after execution of sentence in juvenile prisons or other correctional facilities. In addition, during the continuation or after completion of protective measures, when expressive materials have been newly discovered showing that protective measures were taken despite the fact that there were no reasons for the commencement of the hearing, the family court that made such decision of protective measures must revoke such measures with a decision.